An Impression is a view of an advertisement, which could be the opening an email or the viewing of a banner image on a webpage. CAKE uses Impression pixels in order to track these actions. 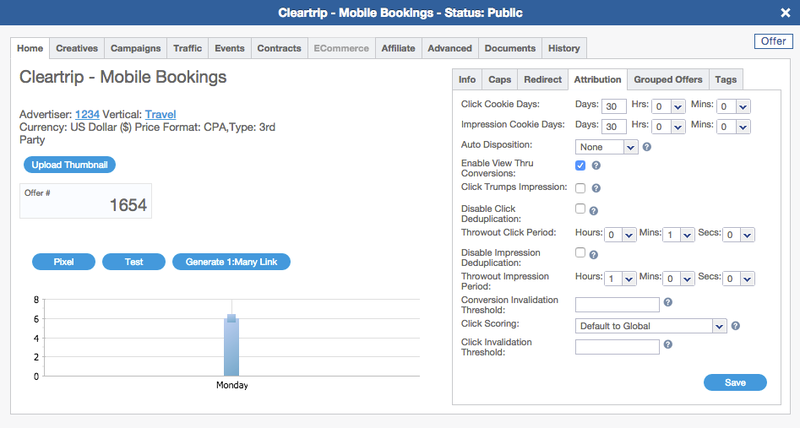 One reason to track Impressions in CAKE is to pay affiliates on a Cost Per Milli (CPM) price format. With this price format, affiliates earn a commission for every 1,000 impressions tracked on that Campaign. Another reason to track Impressions is to see the Click Thru rate of a Creative. The use of the Impression pixel here allows you to see how many people viewed and then clicked on an ad to redirect to the landing page. Log in to the Admin Portal. This will take you to the dashboard view. 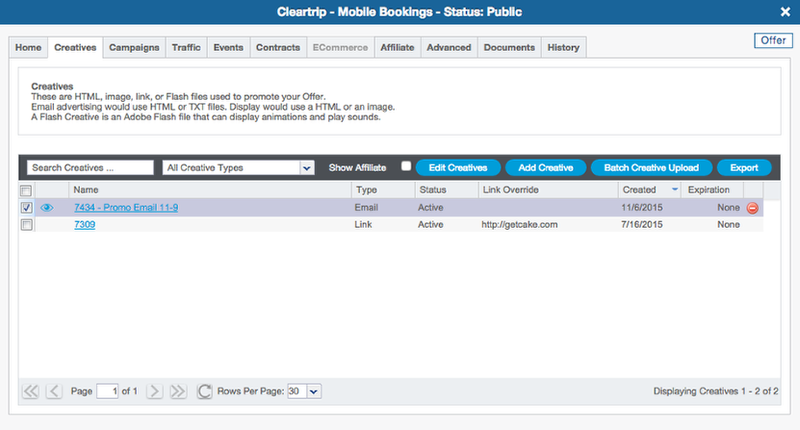 Hover over the Affiliates tab in the top navigation panel. A drop-down will appear. If this pixel is to be used in an email, enable the Use In Email checkbox. Note: This field is not required. 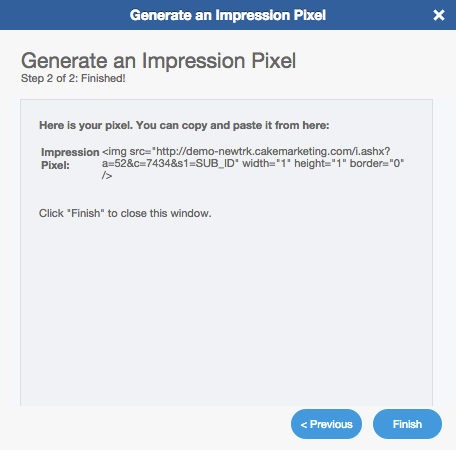 Review the Impression pixel generated by the wizard. If correct, click to select, then copy. 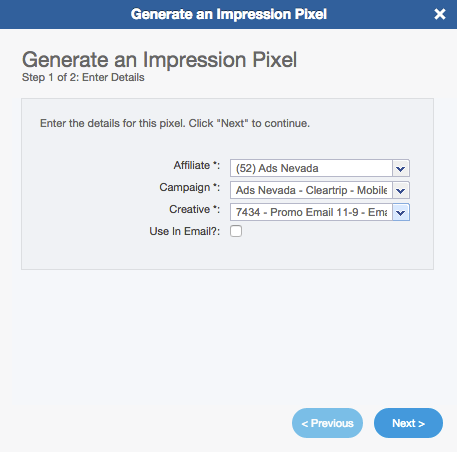 Impression pixels can be added into a Creative HTML file directly from the Admin Portal. Click on the Creatives tab. Select the Creative ID that contains an HTML file for adding an Impression pixel. Verify the Impression pixel token, #imp#, has been added to the code. Note: When affiliates log in to their portal and select Get Code for this Creative, the Impression pixel token, #imp#, will be dynamically replaced with the affiliate's unique impression pixel for this Creative ID. Impression Cookie Days is the duration in which a cookie will live on a user's browser after the Creative has been viewed. This means that CAKE will track one unique impression per user for the Offer within the Cookie Days timeframe. Additional Impressions to the cookie'd user from the same or a different affiliate would be considered a duplicate within this time frame. CAKE's default Impression Cookie Days is set to 30 days but can be adjusted from the Attribution tab of the Offer card. Note: If, Disable Impression Deduplication is checked, all Impressions displayed to a user will be considered unique no matter the time amount for Cookie Days. View Thru Conversions are CAKE's ability to track a conversion, even in the absence of a click. An example of this is a consumer who views an ad on a webpage, then navigates directly to the brand website to convert without clicking on the ad. What is Click Trumps Impression? When tracking View Thru Conversions, there may be a situation where a consumer views a creative from one affiliate, but then clicks on a Creative from a different affiliate. With First Touch attribution enabled, the affiliate that generated the impression (first touch) would receive credit for the conversion over the affiliate that generated the click. However, if you wish to give conversion credit to the affiliate that generated the click (second touch), as a click may be more valuable than the impression, you would need to enable the setting Click Trumps Impression. Check the Click Trumps Impression box. Impressions can be seen in all CAKE Reports in the Views column. 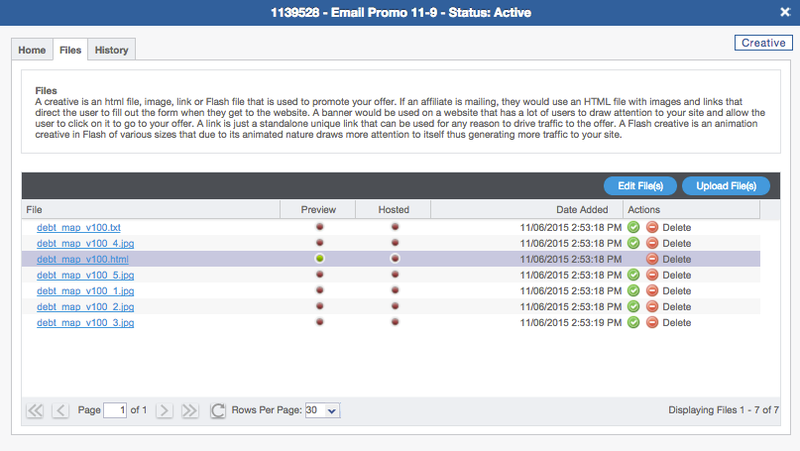 If View Thru Conversions has been enabled on any of your Offers, add the "View Thru Only" filter to your Report view. For more information on creating custom report views, please visit the Reporting Walk-thru article.